"It was the best of times, it was the worst of times" sayeth Dickens, and that sums up the year 1884 in Santa Rosa. Those were days giddy with celebrations, easy money and wonderful changes; it was also a time when our ancestors made some awful decisions which would come to haunt the town years later. First there was an event that brought a windfall to the town along with publicity boosters craved. Then old dreams suddenly came true; telephone service began and the train line finally reached the ferries on San Francisco Bay directly - go to the city after breakfast, be back before suppertime. Santa Rosa's 24-carat destiny seemed inevitable and our ancestors invested in that future with wild abandon. A kind of madness seized them, as often happens when people are surprised to find happy days suddenly no longer around the corner. Private investors also raced to build. The most expensive of these projects was the Athenaeum, which was the second largest theater in the state. Most of the original wooden stores along Fourth street were torn down and replaced by new brick buildings. Writing in the summer of 1884 while the trial was underway, local historian Robert Thompson predicted "...it will cut a considerable figure in any future history of Santa Rosa. It has brought hundreds of persons to this city who would not otherwise have come, and its results will reach in directions not now anticipated." It certainly brought in lots of money - legal fees and court costs for the 23 month bench trial exceeded $200k, equal to about $7 million today. There were some thirty lawyers involved; the railroad's attorneys stayed at the Grand Hotel ("in honor of its distinguished guests, [it] has discarded all the traditions of country hotels and has gone in for a French cook and finger bowls" -Alta California). While Mrs. Colton's troops were at the Occidental she had rented a house for herself on McDonald avenue, and the carriage company that was usually only in demand at weddings and funerals found itself constantly busy. Their driver even upgraded his old sombrero to a beaver hat. The Alta California reporter poked fun at provincial Santa Rosa with its "canals of mud, miscalled streets" and that court sessions would begin with the bailiff standing on the balcony outside while barking that Justice Temple had arrived, so the temple of justice was now in session. This was a weary local joke, particularly silly because the bailiff would follow by announcing details of the Sheriff's livestock auction at noon. The trial of the Colton case is now reaching a point where it is liable to be very interesting. Yet, strangely enough, though Santa Rosa is not suffering from a plethora of dissipation or amusement, the people here leave the trial severely alone. They don't go the Courtroom, and don't even discuss the case in bar-rooms, or read the reports, which come up fresh in the San Francisco papers, for the local press never has a word to say about the case, except that the Court is or is not in session. That thirteen years passed before the rail line actually connected to the Bay had left many fearing it would never happen, particularly because there were gaps when no construction was underway at all. The train reached San Rafael in 1878, but from that point south it was hard going, with three tunnels needing to be engineered. Towards the end there were steam drills boring away 24/7 while a new invention called a steam shovel was brought in to create a railroad yard in Tiburon, with gawkers flocking to the scene to see this hi-tech “Steam Paddy”. It's all quite an interesting story but this is SantaRosaHistory.com, not ReallyCoolMarinRailroadHistory.com - visit the webpage of the Belvedere-Tiburon Landmarks Society for some historic photos. 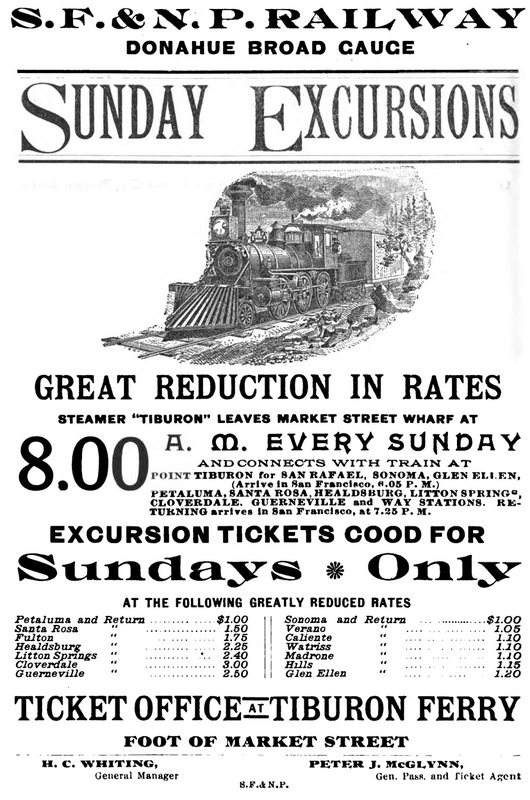 Round-trip fares were initially $3 from Santa Rosa and $2 for Sunday excursion trips, but there were frequent pricing deals. Before long the excursion trains were bringing a thousand or more visitors to Santa Rosa on some Sundays - which turned out to be a terrible mistake. None of these problems had to happen. Petaluma refused to subsidize excursion trains even while they were being encouraged in Santa Rosa; besides the park, realtors had sales promotions that underwrote half of the already discounted excursion ticket price. That Santa Rosa business interests liked the excursions despite the trouble is shown by it taking four years for the City Council to crack down on the riotous scene, and then just canceling the park's liquor license and not addressing the larger problem. To the article mentioned above I'll only add my suspicions that it was such leniency to the excursion traffic which led to our town turning into the Bay Area’s “Sin City,” with the largest red light district between San Francisco and Reno (MORE on that). Of course, Santa Rosans in the spring of 1884 wouldn't have believed any ol' Cassandra who warned their bricky downtown would collapse in a few years or that the train service would lead to their town becoming a haven for prostitution and illegal gambling. It was now time to celebrate all the goodness that was happening - including the opening of the new city hall and starting construction on the new courthouse! They were so excited about the latter that a week after the first train arrived from Tiburon they threw a big party for the laying of the cornerstone - and everyone was invited! The ad here appeared in Petaluma, Marin county and San Francisco newspapers. The Democrat estimated ten thousand were at the ceremony: "...streets were thronged, and groups of people could be found every where, every available window, veranda and awning along the line of march was filled, and the sidewalks were crowded." 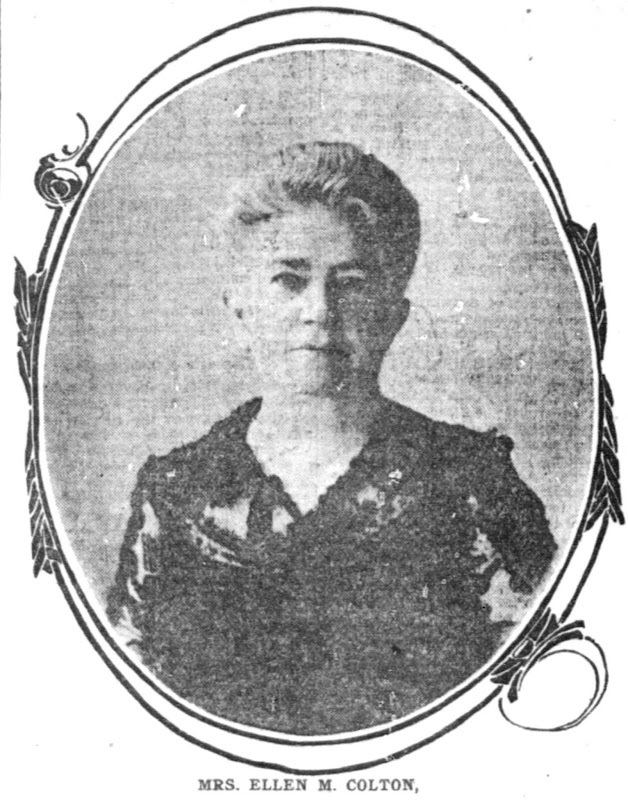 Out-of-town newspapers also covered the doings, and none better than the Alta California - which, Gentle Reader recalls, had a reporter who earlier described Santa Rosa as the city of roses and yokels. Now their anonymous reporter spent a paragraph describing some volunteer fireman from Healdsburg in prose that is the closest thing to erotica I've ever seen in a 19th century news article. I imagine more than a few subscribers choked on their coddled egg breakfasts while reading about a guy who was "if not a joy forever, is at least a thing of beauty:"
...He is immense, all-pervading, superb, gorgeous, resplendent, effulgent, altogether too utterly much. His uniform consists of a blue shirt...dark pants, and a smile of the most comprehensive self-satisfaction that it was ever given to man to wear. As his little heeled boots delicately tamped the Santa Rosa sidewalks and he attracted the furtive notice of the Santa Rosa girls, he was too splendidly conscious of his own beauty for anything...Even Mark McDonald, who is six feet four, owns the gas and water works, besides an Indian bungalow, and has a whole avenue named after him, shrank to small proportions when the beautiful uniform of Rescue Company hove in sight. The General rambled on about the history of cornerstones and how the Romans begat Spaniards who begat Cortez and the years rolled on, blah blah. But he did say one thing remarkable, claiming he and Governor Figueroa came to the Santa Rosa area in 1835 and every Indian in the area came to meet them: "We had 800 troops. We met here. The tribes of Cayuama, Pinole, Reparato, [sic, sic, sic] and all the tribes were collected here to meet the great General. Very well, and what did we meet? About 20,000 people, all naked; no hats, no shirts, no boots, no anything; well dressed, but all naked." There's lots to doubt about that story, but Vallejo really was here in 1835, and it was before the smallpox epidemic which decimated the Native community. After the ceremony "...the crowd made a vicious rush for Morsehead's Hotel, where special feeding-troughs had been arranged for their benefit. Soon there was an exodus of teams and travelers by rail, and by afternoon Santa Rosa was sitting clothed in its right mind." Then the next day the Colton trial resumed and masons went about building lots of brick walls with lousy mortar. It was just another wonderful, busy day in 1884. 1 Prior to 1886 major hotels had private wooden sewers running (south?) to the creek which other businesses could tap into with permission - and presumably a hefty fee. When the new courthouse and Athenaeum were built a year earlier cesspools were included, per usual. Downtown Santa Rosa was honeycombed with them; in early 1886 a storekeeper dug a latrine in his basement only to hit a forgotten cesspool next door. Once the sewer was built and the old cesspools were abandoned, an article in the Democrat titled "The City's Friend," noted that well water was improving: "This poisonous discharge was formerly permitted to go into the gravel strata whence we draw our supply of well water. Now the cesspools are being filled up, and the water is becoming purer and more wholesome." Who would have thunk. 2 The Ellen M. Colton vs. Leland Stanford et al. trial began November 1883 and went on until October 1885. When her lobbyist husband David D. Colton died in 1878 she agreed to a $600k stock buyback, only to discover that another executive who died the same year with an equivalent portfolio received considerably more. Key evidence at the trial were the "Colton letters" (PDF) which were hundreds of letters between her husband and the "Big Four" founders of the railroad. The correspondence - which David Colton had been expected to destroy after reading - proved the railroad was involved in fraud, conspiracy, and corruption with men at the highest levels of federal and state governments. Although she lost on the grounds of having agreed to the unfair stock deal, the outrage which resulted from widespread newspaper coverage weakened the political clout of the railroads (MORE). 3 The SF&NP was the rail line that went from Santa Rosa (and points north) to Tiburon. A different railroad, the narrow gauge North Pacific Coast, went from San Rafael (and points west) to Sausalito. The NPC liked to boast it offered better service and had better equipment including faster ferries, and would thrill passengers by racing the SF&NP ferry from the San Francisco docks. An oft-repeated story was that the NPC superintendent would give a ferryboat captain five demerits if he was caught racing - and ten demerits if he lost the race. A Truthful Report of Yesterday's Proceedings. Her Early Life, Marriage and Widowhood — Her Legal and Business Advisers - Moneys Drawn from the W. D. Co. Resumed at Santa Rosa After Six Weeks' Rest. Thursday last was a red letter day on the east side of town. Col. Donahue had issued invitations to many citizens to take a run to Point Tiburon and back, on that day. A large number of the prominent men of Sonoma county came down on the 8 o'clock train, and were joined here by our people. After a charming run to Tiburon, a part went to the city, and others stopped at the Point, anxious to take in the improvements located there and have a look at the surroundings. At 10 o'clock Col. Donahue, with several hundred invited guests, left the city by special boat, and reached San Rafael about 11. They were met at the Fourth street depot by a great many of our people who received them with hearty cheering, supplemented by music by the San Rafael Band, all of which but feebly expressed the joy of our citizens at the successful organization of an enterprise which will double our facilities of communication with the metropolis, and confer upon us the countless substantial benefits which must follow that consummation. Took the stand reluctantly, but when he spoke it was practical and pointed. This is May Day, he said, the day of play for children, and we are all children. I am glad to see you here, and to be here to see you. We have now the means to bring you here, to give you all a ride. We have had many obstacles to fight in making this road, and it is not yet finished. We have to go slow yet, because we don't want to hurt you, nor to have any big damages to pay. But we expect to perfect our work by and by, and carry you all to the city and bring you back. And we will do it in forty-five minutes. We want you all to ride, and pay your fare, low fare, and we don't want any deadheads. I see my banker is here, looking after his security, and I guess he'll let me have some more money to-morrow. But we will now go on, to Petaluma and Santa Rosa. All get aboard, and we'll have a ride and some sandwiches. ...Long before 8 AM, Santa Rosa commenced to fill up with folks from the surrounding country. They came in all sorts of teams, generally well provided with lunch baskets, for there was to be a dance at the Pavilion in the evening, and they proposed not to squander their substance on Santa Rosa hotels. One features of the procession was the presence of all the local and neighboring fire companies, and it was really a beautiful sight to see the Santa Rosa company dip hose to the Healdsburg company, as the "Rescue" from the latter place hove in sight. On each occasions as this a Healdsburg fire Jake, if not a joy forever, is at least a thing of beauty. He is immense, all-pervading, superb, gorgeous, resplendent, effulgent, altogether too utterly much. Consists of a blue shirt stamped "Rescue," a glazed tarpaulin hat which looks as if left over from the Hayes' and Wheeler campaign. A belt stamped "Rescue," dark pants, and a smile of the most comprehensive self-satisfaction that it was ever given to man to wear. As his little heeled boots delicately tamped the Santa Rosa sidewalks and he attracted the furtive notice of the Santa Rosa girls, he was too splendidly conscious of his own beauty for anything, and if old Grant had come along just then the General's hat would have been in his hand before he could restrain a salute to so imposing a spectacle. It was too much for Santa Rosa. The town is hardly large enough of so much gorgeousness and the consequence is that the Court House, town, procession, and the whole Grand Lodge were overshadowed and obscured by Rescue Company Healdsburg No. 1. Even Mark McDonald, who is six feet four, owns the gas and water works, besides an Indian bungalow, and has a whole avenue named after him, shrank to small proportions when the beautiful uniform of Rescue Company hove in sight. Began to form about ten o'clock, by which time the Plaza was almost full. As the bands began playing, the figure of poor old Hullio Carrillio could be seen leaning from a carriage in the procession. Poor old Hullio. He is one of the last vestiges of the Spanish occupation of Sonoma. His was once the Santa Rosa grant, and far as the eye could reach from where the poor old man stood every inch of the land, every lovely shrub and tree on the hillsides, were once his. He played the role of a Spanish grandee in a lordly fashion; so lordly in fact that one by one his acres slipped away, and as he stood and looked at the gay throng to-day he could not forget that he was poor and landless. In the flush old times, when Santa Rosa first began to be a town, poor Hullio had donated from his possessions two score choice acres for a town plaza, the very plaza on which the Court House was built, and it was but a fitting, kindly act for the committee to have remembered old Hullio and given him a place of honor along with old General Vallejo. The procession formed at the plaza and was a pretty fair article of procession, as the processions go nowadays. And the steps taken towards its erection. The next orator was ex-Judge Wheeler of San Francisco, who read a beautiful oration on the Santa Rosa Court-House in particular, and Court-houses in general. The usual box of relics was put in the corner-stone. In it was put copies of the San Francisco and local papers, a copy of the deed of gift of poor old Hullio to the town, a copy of Fullerton's corrections of exhibit D, as a memento of the Colton trial, a few coins and the card of Miss Bennett, the daughter of the architect of the building. Whenever there was a lull in the proceedings one or more of the rival bands played a tune, and added to the general hilarity of the occasion. After the usual Masonic ceremonies the gathering broke up, and the crowd made a vicious rush for Morsehead's Hotel, where special feeding-troughs had been arranged for their benefit. Soon there was an exodus of teams and travelers by rail, and by afternoon Santa Rosa was sitting clothed in its right mind. During the evening there was a grand ball at the race track pavilion, where to the music of the boss Santa Rosa band the fairest youth of old Sonoma did the light fantastic till the "wee sma' hours." The affair was voted most recherche and the most thoroughly enjoyable event of the season. Leaving San Rafael, we glide smoothly along the new road, through a tunnel, over Corte Madera creek, through "the long tunnel,” and over cut and fill with Richardson’s Bay and Saucelito, in full view on the right, past hills on which innumerable herds of cattle are feeding, through the last tunnel, on to Point Tiburon. Here we found the steamer James M. Donahue in the slip, step on board and in twenty-three minutes later, are ready to disembark at Clay street wharf. ...After the column halted and disbanded, the Grand Lodge F. and A. M., took their positions on the platform, accompanied by the officers of the Day and a number of invited guests, the different orders of the Masons formed in due and ancient form about the corner stone. ...The Grand Master. Brother Grand Treasurer, it has ever been the custom of the craft, upon occasions like the present, to deposit within a cavity in the stone, placed at the northeast corner of an edifice, certain memorials of the period at which it was erected, so that, if in the lapse of ages, the fury of the elements, the violence of man, or the slow but certain ravages of time should lay bare its foundations, an enduring record may be found by succeeding generations to bear testimony to the untiring, unending industry of the fraternity of Free and Accepted Masons. Has such a record been prepared? Articles contributed tor the comer stone by R. A. Thompson: “California As It Is" written by seventy leading editors and authors of the Golden State, for the weekly Call; map of the State of California; historical and descriptive sketch of Sonoma county; map of Sonoma county; Resources of California, with pictures and descriptive sketches of Santa Rosa and Petaluma, Sonoma county; one cent, date 1817; one half-dollar, date 1831; Obsidian arrow-head from California; Indian arrow-head from Washington Ty. ; Russian River Flag; Pacific Sentinel; the Sonoma weekly Index; the Petaluma Courier; the Sonoma Democrat; the Healdsburg Enterprise; the Petaluma Argus; rosters of State and county officers; State and county Governments, 1883, Executive, Judicial and legislative Departments; Thompson's map of Sonoma county, 1884; copy of Republican. daily and weekly; Sonoma County Journal, (German); Sonoma county “Land Register," published by Guy E. Grosse, Proctor, Reynolds A Co., real estate agents; cards of the architect and his daughter; copy of Day Book... [lodge rosters and documents] ...financial report of Sonoma county for 1881, 1882, 1833 and 1884; Sonoma county Court House—A. A. Bennett and J. M. Curtis, architects; Carle & Croly, contractors; copy of San Francisco evening “Bulletin;” copy of daily "Alta California;" copy of daily “Chronicle;” copy of dally "Call;" copy of daily “Examiner;” copy of daily evening “Post," with compliments of C. A. Wright, news agent Santa Rosa; muster roll, bylaws and constitution of Santa Rosa Commandery, No. 14, K. T.; muster roll, bylaws and constitution of Mt. Olivet Commandery, No. 20, K. T., of Petaluma; by Losson Ross, a quarter of a dollar, date 1854; by James Samuels, 5 cent nickel, 1869; by A. P. Overton, ½ dime, 1840; by E. Crane and A. P. Overton, one standard silver dollar, 1884; by Mr. and Mrs. S. R. Smith, one copper cent, 1833; and one copper two-cent piece of 1865; card of M. Rosenburg, merchant, builder of the first brick store in Santa Rosa.